PolyFlex DS Single 21oz. 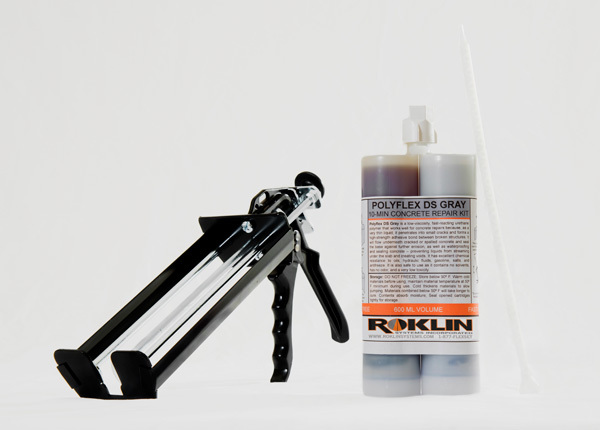 Cartridge – Roklin Systems Inc.
PolyFlexDS repairs set up to a more flexible repair. PFDS is ideal where there is a lot of motion in the pavement. The polymer is a natural color and can be topped with gray or black sand to match your pavement. Make sure the crack is clean and free of moisture. If there is a lot of water, use a blow dryer or torch to make certain the crack is dry. Open cartridge and squeeze PFDS directly into the crack. Use a scraper or straight-edge to smooth the material out. Wipe up any excess material and allow to dry for 30 minutes. Now the crack is filled and ready for use. Roklin’s long-lasting solution is complete with almost no preparation and little drying time. PolyFlex DS repairs set up to a more flexible repair. PolyFlex DS is ideal where there is a lot of motion in the pavement. The polymer is a natural color and can be topped with gray or black sand to match your pavement. Make sure the crack is clean and free of moisture. If there is a lot of water, use a blow dryer or torch to make certain the crack is dry. Open cartridge and squeeze PFDS directly into the crack. Use a scraper or straight-edge to smooth the material out. Wipe up any excess material and allow to dry for 30 minutes. Now the crack is filled and ready for use. Roklin’s long-lasting solution is complete with almost no preparation and little drying time.